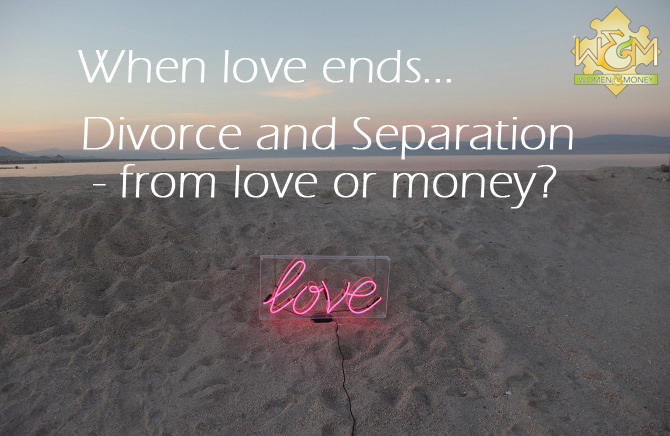 When love ends… divorce and separation from love or money? This morning one of the headings in the Vancouver Sun jumped right off the page: When Love Ends Family Law Takes Over . The notion that ‘when love ends’ rather than if love ends paints a sad if not tragic picture of relationships today. Back in the 1960’s and early 70’s, love reigned supreme for a generation that found liberation – true liberation from the lingering shadows of the repressed Victorian age and historical prejudices in an antiquated social justice system. Universal love was a newly discovered language. Unfortunately, this translated into the public acceptance of one-night stands and a hedonistic ‘we’re here for a good time, not a long time’ lifestyle. Long term relationships, similar to life-time careers, were substituted for short term pleasure and hippie-styled communal living. Of course this grandiose social experiment in love had a short shelf-life, killed off partly by hepatitis and the perils of drug addiction. What happened next? A decade of social justice reforms followed with the birth of dual income families and day-care centres. Marriage still maintained a dominant presence as the natural conclusion to dating and cohabitation. A strong preference existed for couples to live together first as anxiety flourished over how relationships changed after a marriage. People worried that marriage would strangle love not embellish it. Marriage threatened people. The new family landscape somewhat supports the ‘when love ends’ thesis although no reliable statistics exist for the separation rate of common-law relationships. Moreover, there is little agreement as to what has caused families to end – was it love or money? What we do know is this. Families today are under a lot of pressure. The idea of dual incomes to support and raise children rarely is subjected to choice today. People need the money. The cost of living undoubtedly causes tremendous trouble for struggling families – the cost of housing, the cost of day-care, transportation costs, sports and post secondary education provide an endless source of anger and frustration. I can tell you that there is no pressure greater or more devastating to individuals and families than financial pressure – especially when you are in the grip of a debt spiral you no longer control. In many respects the question is not, when love ends, but rather, how can it survive without adequate financial resources? Yes, I believe that the recent amendments to BC family legislation are good and, more importantly, fair. I don’t think, though, that people have entered common-law relationships to get a better deal than marriage after a separation. Instead, they struggle with the same issues and dynamics that married families do. The tragedy in my opinion is the disintegration of families – and what this means for everyone – the children, retirement savings and wealth accumulation. Maybe we should support all families better so that love can survive rather than fixing holes in a separation and divorce process, when it is a bit late.